Eternal Throw is a company that began on the road home from the National Yo-Yo Contest in 2011. Chad Sage and Free Hinton started to dream about how they got involved in the local community and yoyo community as a whole. Both fathers and yo-yoing almost daily for 13 or 14 years they know first hand the potential a yoyo has to develop confidence, healthy relationships and personal growth. Eternal Throw and Victory was born of this passion and their drive to spread yo-yoing. 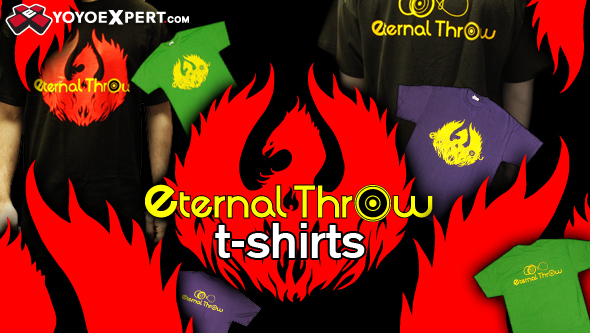 With the official release of their new yo-yo the Victory we also have a limited supply of some great Eternal Throw T-Shirts featuring their logo on various shirt colors!